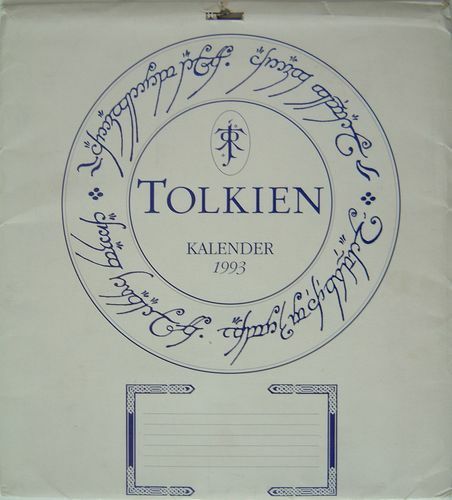 Contains the first of those issued by the Finnish Tolkien Society, a very rare Russian calendar, and a calendar based upon an iconic 1977 poster. 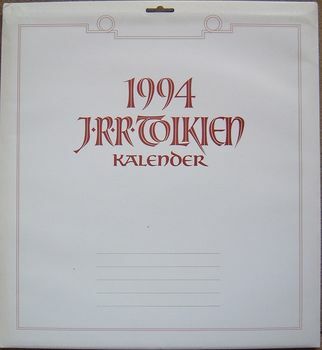 "The 1993 J.R.R. 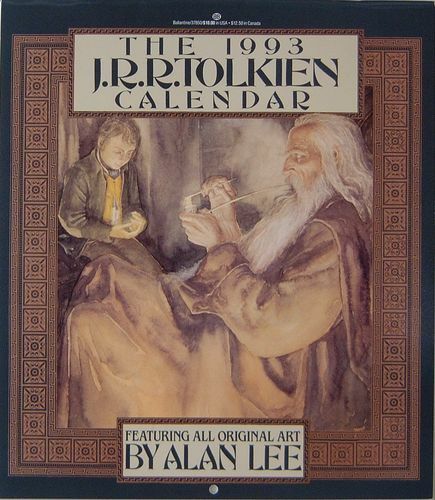 Tolkien Calendar" Illustrations by Alan Lee. Dimensions: 10.5 x 12 inches (w x h); stapled; punched hanging hole; shrinkwrapped. "The Tolkien Calendar 1993 by Alan Lee" Illustrations by Alan Lee. 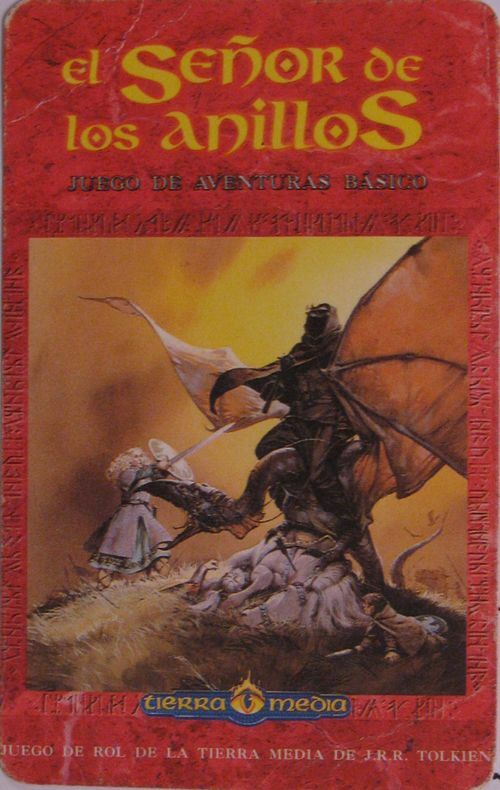 Cover: "Two Orcs". 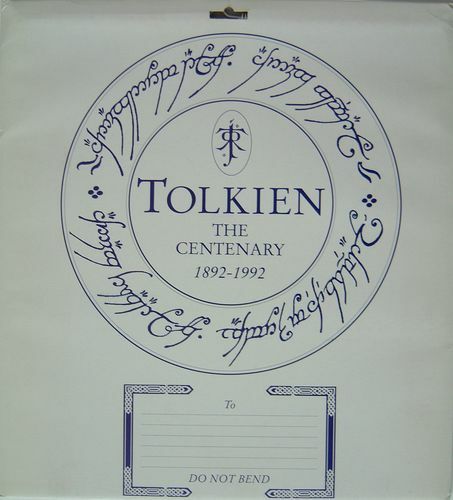 Dimensions: 13 5/8 x 15 inches (w x h); wire bound; heavy wire hanging loop; medium-weight paperboard mailer/envelope printed with “Tolkien The Centenary 1892 - 1992” in blue ink. 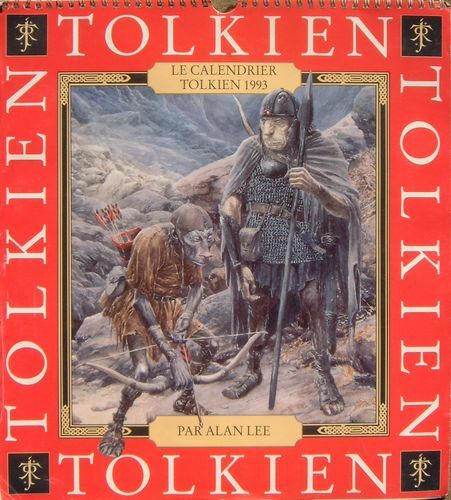 VARIANT: "Le Calendrier Tolkien 1993 Par Alan Lee" Published in Drancy, France by Grafton Books; printed in Hong Kong. Illustrations by Alan Lee. 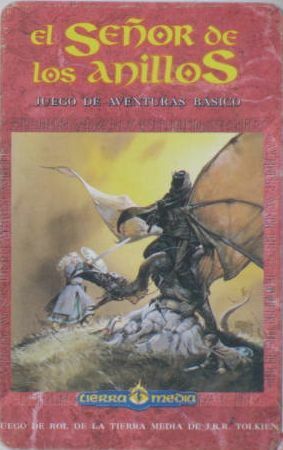 Cover: "Two Orcs". Dimensions: 13 5/8 x 15 inches (w x h); wire bound; heavy wire hanging loop. 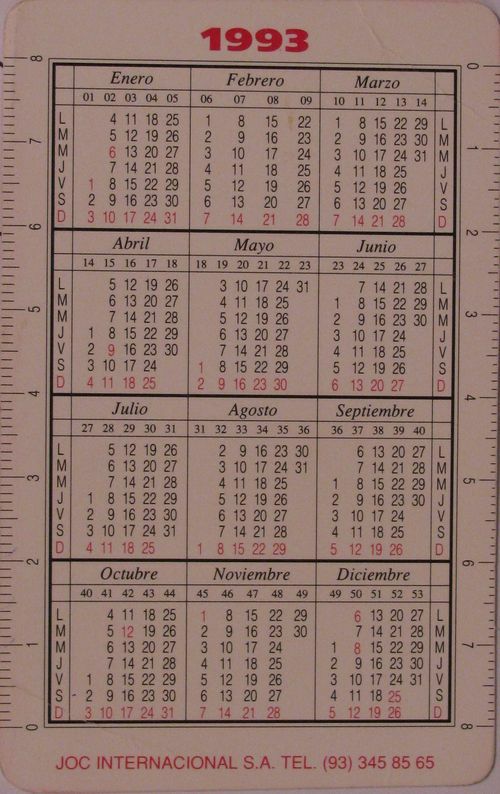 “el Señor de los Anillos" Credit card-sized calendar with 1993 calendar on back. 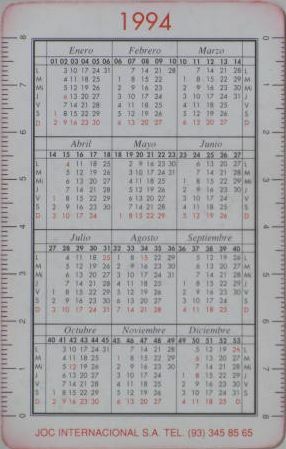 Dimensions: 2 3/8 x 3 3/4 inches (w x h). 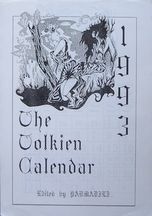 "The Elvish Calendar 1993" Title translated from Russian. 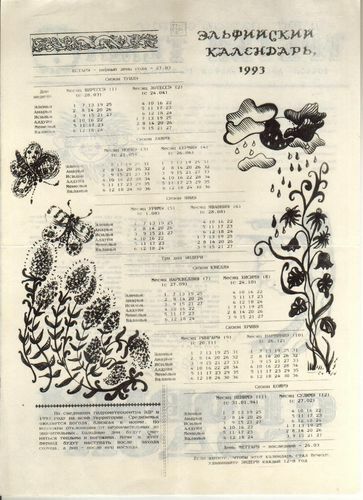 One page calendar found as page two of "Tret'ya Tema" (Third Theme) Leaflet of the Elves of Mithlond (Boevoi listok el'fov Mitlonda), issued Nov. 1992. Rarity: 10 Known only from its entry in the Marquette University collection. 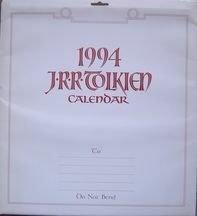 "The 1994 J.R.R. 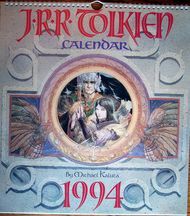 Tolkien Calendar" Illustrations by Michael Kaluta. Dimensions: 11 x 12 inches (w x h); stapled; punched hanging hole; shrinkwrapped. 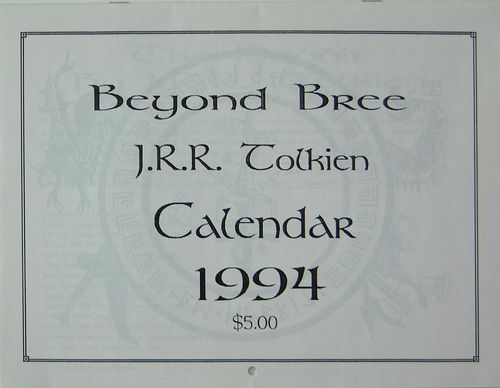 "Beyond Bree J.R.R. 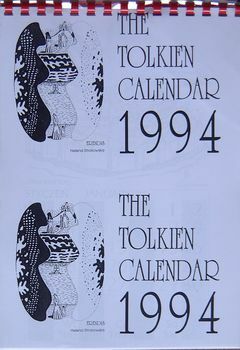 Tolkien Calendar 1994" Published by the American Mensa Tolkien Special Interest Group; edited by Sara Duniphin. 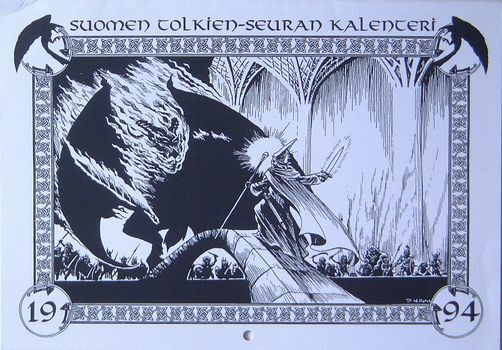 Pen and ink illustrations by seven artists inspired by "The Hobbit". Dimensions: 11 x 8.5 inches (w x h); stapled; manila envelope. VARIANT: “J.R.R. 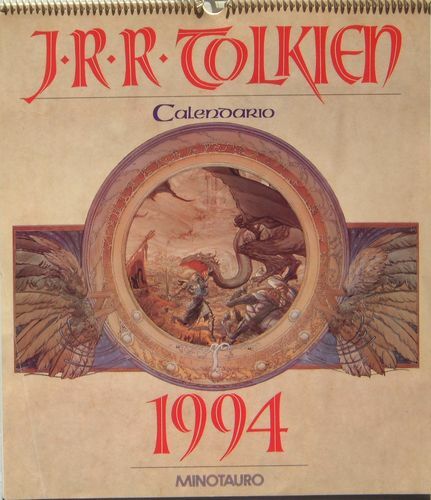 Tolkien Calendario 1994” Illustrations by Michael Kaluta. Dimensions: 13 3/8 x 15 1/4 inches (w x h); plastic wire-bound; thick plastic hanging loop. 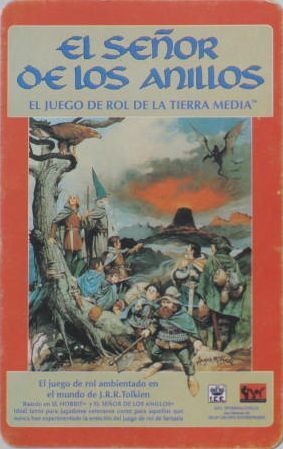 "J.R.R. 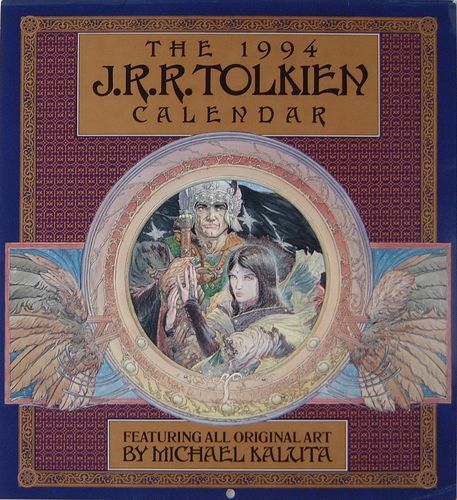 Tolkien Calendar by Michael Kaluta 1994" Illustrations by Michael Kaluta. 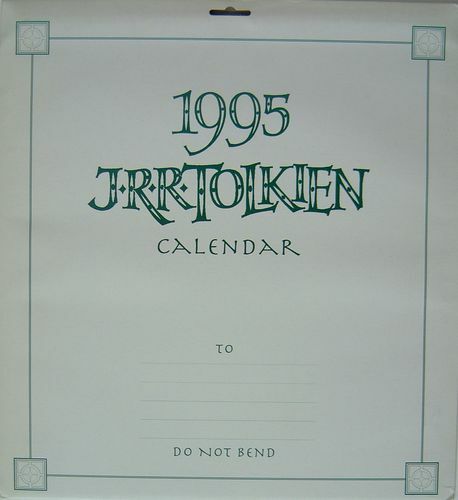 Dimensions: 13 5/8 x 15 (w x h); wire bound, heavy wire hanger; mailer/envelope. 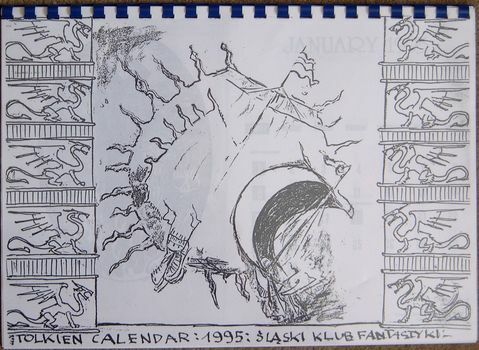 “el Señor de los Anillos" Credit card-sized calendar with 1994 calendar on back. Dimensions: 2 3/8 x 3 3/4 inches (w x h). 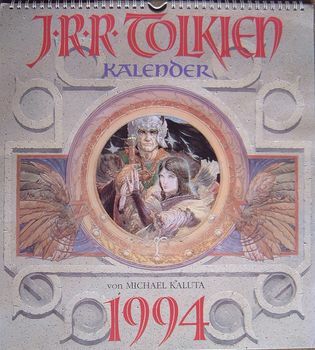 "Lord of the Rings 1994" Published by Wizard&Genius-Idealdecor AG, Oetwil am See/Zurich, Switzerland. 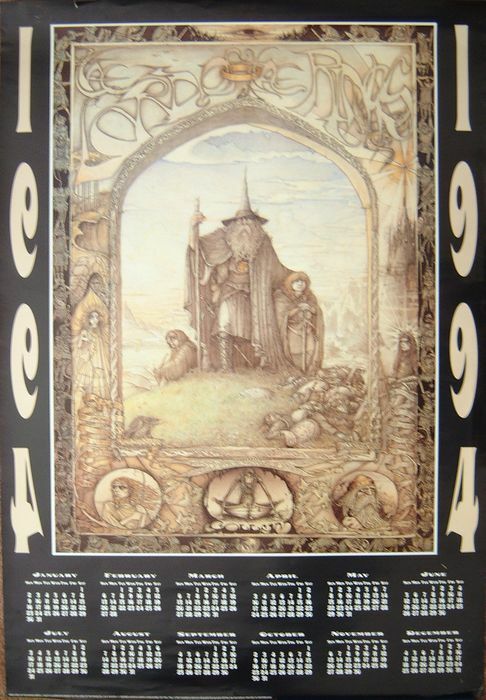 Poster size 1994 calendar using the iconic 1977 James ("Jimmy") Cauty Lord of the Rings illustration that has appeared on (literally) millions of copies of the poster. Read about the original here. Dimensions: 26 3/4 x 38 5/8 inches (w x h). Rarity: 9 As a commercial issue, a large number were produced. However, these are very hard to find. Has appeared only once on eBay. "J.R.R. Tolkien Calendar 1995" Illustrations by John Howe. Dimensions: 13 5/8 x 15 inches (w x h); wire bound; heavy wire hanging loop; medium-weight paperboard mailer/envelope. VARIANT: "J.R.R. 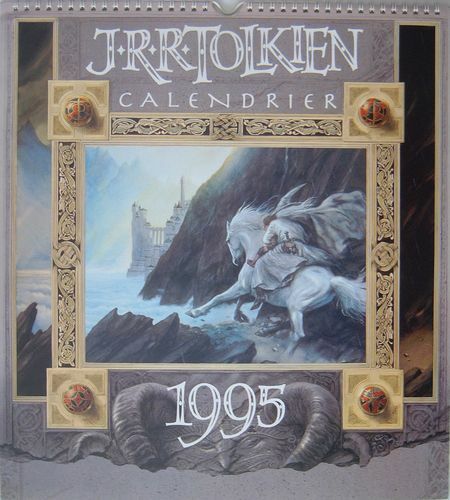 Tolkien Calendar 1995" Illustrations by John Howe. Dimensions: 13 5/8 x 15 inches (w x h); wire bound; heavy wire hanging loop; medium-weight paperboard mailer/envelope. VARIANT: "J.R.R. 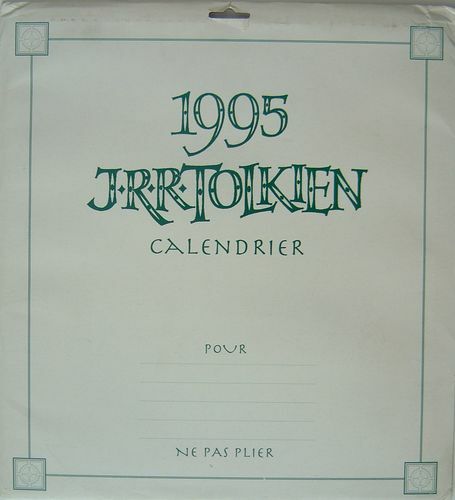 Tolkien Calendrier 1995" Printed in China. Text in French. 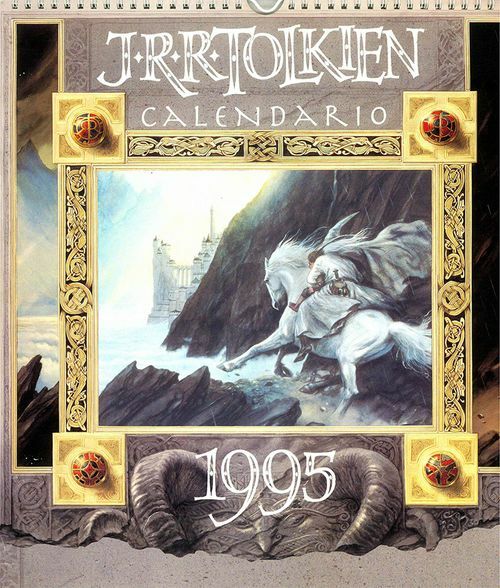 Illustrations by John Howe. Dimensions: 13 5/8 x 15 inches (w x h); wire bound; heavy wire hanging loop; medium-weight paperboard mailer/envelope. 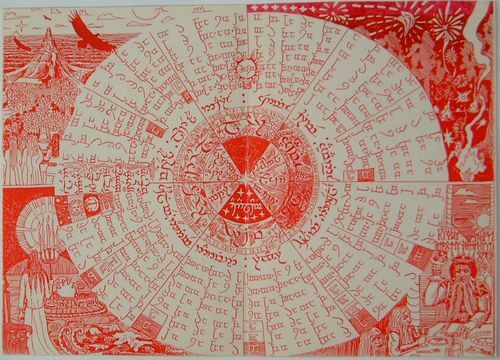 Single sheet printed in red ink. 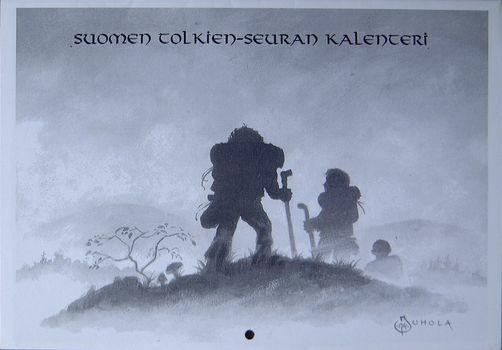 Based upon an original illustration that you can see on his website. Dimensions: 8 1/2 x 6 inches (w x h).